Pele hates his nickname, 1/3 of all cod fished in the world is consumed in the U.K., and 98 other fascinating tidbits. We spent the holiday among family and friends. Started Christmas Eve with our traditional holiday dinner. Mom, Katharine, and I spent much of the afternoon cooking, and our good friend Julie Anne joined us midafternoon to add another person to the kitchen entourage with her baked Brie appetizer and two kinds of pie. Our newer friends Dave and Jack joined us for dinner and we spent the evening reveling in the spirit of the season, telling our oldest stories and enjoying the good meal and chance to get to know everyone. On Christmas Day, we made waffles with my new waffle iron (rocked utterly) and spent the late morning with gifts and coffee and a bit of reminiscing. In the afternoon we brought out Katharine’s game Mad Gab, an amusing (and sometimes incredibly difficult) game of nonsense phrases put together to sound like common words or sentences. You try to guess the actual word or sentence by sounding out the printed phrases, with sometimes comical results (see tagline). We spent half an hour or so in the early evening trying to filter out and package the turkey stock we’d created overnight. Turns out it takes several containers to hold the fluid volume of a 12-quart stock pot. Seems plainly evident now but last night it was such a shock as we cast about trying to find just one more jar or canister or plastic container to fit the last of the stock for the ride back to Julie Anne’s kitchen. Today brings the return to work, our return to normalcy somewhat. I’m working with Katharine tonight (we get just Christmas Day as a work holiday, even though everyone else has today off too), so I won’t be in the office until tomorrow, which is why I can be lounging around my townhouse in shorts and a T-shirt just before 09:00, making this web-site entry instead of freaking out about being late for work. My drive to work took 28 minutes door-to-door. Absolutely no delays anywhere, exactly as I expected. Now this is the way I like it. My drive home—actually, into downtown Seattle, as I’m meeting family and friends for dinner—will likely take considerably longer as everyone tries to flee the city for their own holiday celebrations. I’ll be monitoring bridge traffic quite closely all afternoon. Last night I carried a couple bags of trash out to the bins but they were full, so I carried the bags back to my garage for quick disposal after the apartment folks empty the bins into the big compactor. When I got back into the kitchen a minute or so later, my left index finger was completely numbed out from the last knuckle to the tip. It’s an odd sensation—the tip of my finger feels about twice as large as it really is because the skin’s touch sensitivity is reduced so much. No idea why it happened. No bruising or pain, just the numb feeling, and it goes away if I rub vigorously at the fingertip or while I’m typing with the repetitive striking of keys. But the numb sensation returns after a minute or so of inactivity. Last night I pulled my car up to the front door when I arrived home. I had some groceries and I wanted to unload them through the front door directly into the dining room rather than trooping through the garage, up the stairs to the living room, down the corridor past the kitchen, and finally to the dining room. I forgot I’d left the car out front until about two hours later, by which time I’d changed into my usual alone-at-home casual clothes, cotton shorts and a T-shirt. I was also barefoot because in the trash-bin trek earlier, I’d soaked the soles of my slippers, and they were drying in the garage. So when I remembered about the car, I just walked outside in shorts and T-shirt, barefoot, and hopped across the (cold! wet!) lawn into the car for the quick drive around the building to the garage. It’s weird to drive a car barefoot. I’m used to the thickness of my shoes and I nearly sent myself through the windshield twice when I stepped on the brake a bit too hard. On my way to the grocery store last night, I managed a 6.4-mile stretch without a single stop for red lights on my old back-roads route home from the lab. In the nearly two years I’ve lived in this area, I’ve never managed to make that stretch without stopping for at least two red lights. I was pleased. Today promises to be fairly dead at work, which means it would normally be a good day to learn a lot of stuff. Except nothing much is happening, and since the best (for me) learning experiences happen with active projects, it’ll probably be a day of chatting with the three other workers on-site and the occasional allegedly high-priority problem report and a fair bit of coffee-drinkin’. I thought I had a lot more to say today but it’s all dribbled out of me brane. Have a good weekend and a Merry Christmas. Holiday trains at Seattle Center WinterfestSeattle Center’s Winterfest in full swing with an extensive train set-up mimicking an 1880s town. Kids can take a guest-conductor turn for a $5 suggested donation. Hot chocolate. I like egg nog, but absurdly sparingly—it’s so rich, a single small glass is all I need to last me the entire season. Does Santa wrap presents or just place them under the tree? Wraps. Everything under the tree is wrapped no matter the source. When I was a kid, we had a riot of different colors and sizes of lights on our tree, including some of my all-time favorites, the bubble lights. 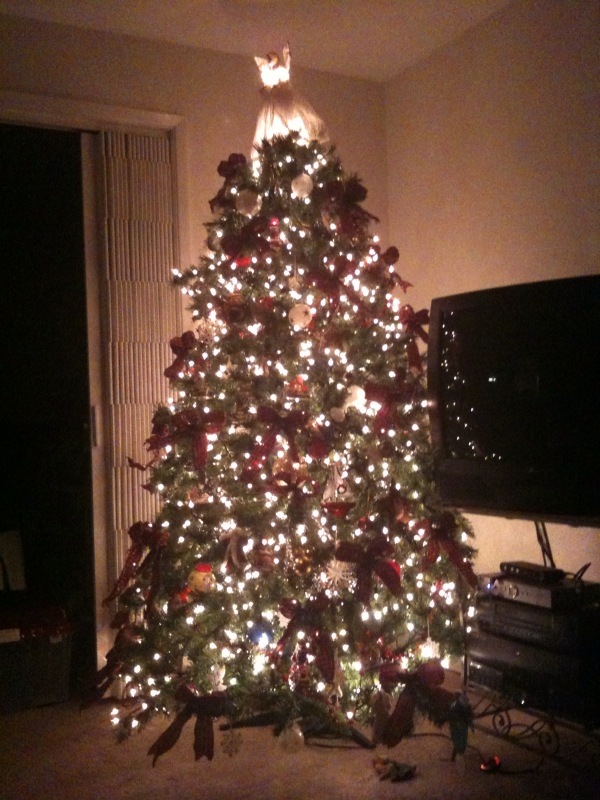 Now, we use the small-bulb white strands and the effect is simply spectacular. I’ve had iTunes running for much of the last 24 hours and, via the magic of a smart playlist, just found out I went through two hundred and change songs. Music I'm willing to share is linked directly from this page. No link, no sharing—don't email asking for files.So of course my next impulse was to post the list here. 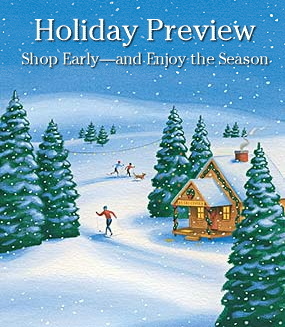 You can start at L.L.Bean, where I just now saw their Holiday Preview graphic on the home page.